I have recently returned from 5 weeks of travelling. One of my stops was Sydney, Australia to visit my brother who has been living there for around 20 years. Last time I saw him was my holiday in July in Italy, not long ago but he was aware of my tattoo removal journey. He had told me of someone he knows that does tattoo removal but not using lasers, using acid! Apparently acid (lactic I think) is injected into the tattoo. This causes the tattoo to burn up to the surface of the skin and fall off as a scab. Apparently this is very fast as it will heal in a couple of weeks and the treated ink will be gone! Proponents of this method say it is safer than lasers as the ink falls out of your body instead of being broken up by your lymphatic system. They say that since tattoo inks are made of heavy metals, having your body absorb them is bad. Using acid, it is not absorbed by your body, rather your body ejects the tattoo and acid. The method sounds excellent, if it really does work. I question the safer part though. While it is true that lasers break up the tattoo and have your lymphatic system remove the ink, once you get a tattoo, it is in your skin. Your immune system is working on breaking it down immediately. I (no medical training) can't imagine laser treatment makes this any worse. It would happen faster but those same metals are already in my skin and my lymphatic system has been trying to remove them since I got this, 14 years ago. I think I'm too far along my laser journey to try a different method but I am fascinated by this. If it really is this fast to remove a tattoo, it changes everything. 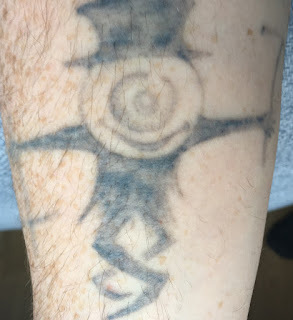 Tattoos could likely be removed in a matter of months, not years (I'm now at 15 months since my first laser session). I did a little (very little) reading on this method after I heard about it. Apparently it does work but is risky, if done even slightly wrong it can leave permanent scarring. I have probably read the same about laser treatment though. I think people say lasers are better as they've been used for longer and are more proven. I really would love to learn more about this acid method though. If anyone has gotten it or knows someone that has, I'd love to hear how effective it is. I took the above image today, 3 months since my last Picosure session. I really am seeing progress now. I know that waiting is best, the more wait the more it will fade but I'm really keen for another session. I really want to see how much difference the next one will make. I'm pretty certain that this is the first time since I started on this journey that I have felt really positive about the removal process. I'm planning on waiting until May or June for my next session, maybe even longer depending on the weather / plans. It's much easier to manage laser treatment in the winter, no chance of sunburn leading to scarring. There's also the unlikely possibility in summer of a tan, they won't laser you if you're tanned, it can lead to pigmentation loss.